What Happens if Meat Unfreezes and Then Is Refrozen? If Meat Is Frozen, How Long Does It Take to Go Bad? Can You Cook Frozen Foods That Are Past Their Expiration? 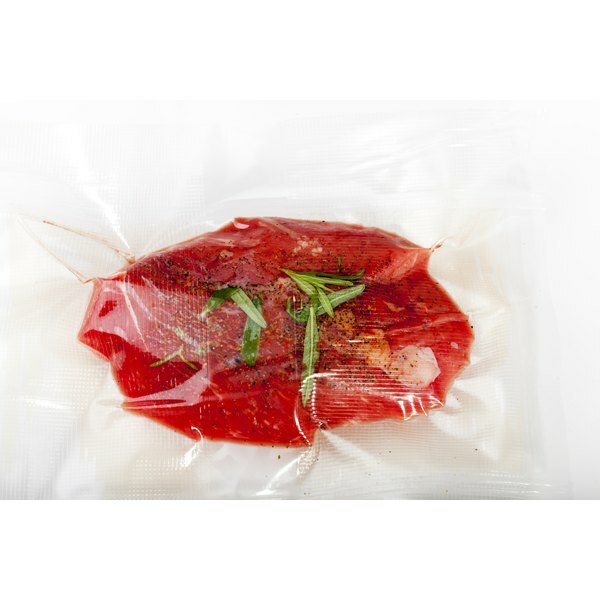 To thaw meat quickly, place it in a sealed bag and immerse it in cold water. 1 What Happens if Meat Unfreezes and Then Is Refrozen? 2 If Meat Is Frozen, How Long Does It Take to Go Bad? 3 Can You Cook Frozen Foods That Are Past Their Expiration? 4 How Long After Cooked Food Is Frozen Should It Be Eaten? Freezing food is a convenient method of preservation, yet it can cause the quality of the food to deteriorate. However, losing taste and texture is not the biggest danger of thawing and refreezing meat. If performed in an unsafe manner, bacteria may develop in the meat, which could cause severe illness. To ensure that your meat is free from trichini and other parasites, always cook meat thoroughly. Whether fresh, previously frozen or cooked, meat stored at zero degrees Fahrenheit or lower is safe provided it was safe when frozen. At freezing temperature, mold, bacteria and yeast molecules slow down and microbes become dormant. Preventing the microbes from growing preserves food, as they are the cause of spoiled food and resulting illnesses. Freezing meat won't significantly change its nutritional content. Freeze it as quickly as possible to prevent the formation of ice crystals. Wrap meat well to prevent freezer burn. 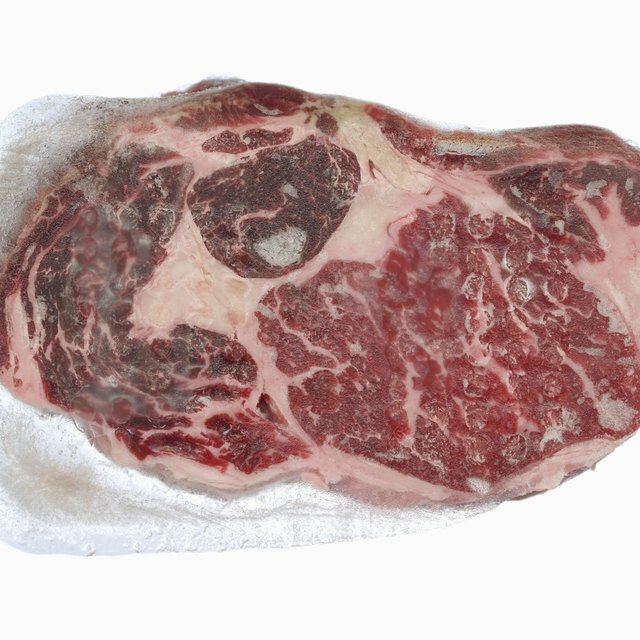 Freezer burn affects meat's color and quality, but does not make it any more or less safe to eat. Some freezers come equipped with a “quick-freeze” shelf which helps you freeze the meat as quickly as possible. Don't stack packages of meat -- spread them out in a single layer on the shelves. After they freeze completely, it's safe to stack them. Use cold water, your refrigerator or your microwave to thaw meat -- never thaw meat at room temperature. The safest method is to place the frozen meat in the refrigerator for a day or two ahead of time. Larger items such as frozen turkeys may take longer -- about one day for every 5 pounds of meat. Thawing meat slowly in the refrigerator minimizes damage from ice crystals, which helps maintain the food's quality. For faster thawing, place meat in a leak-proof plastic bag and immerse it in cold water, changing the water at least every 30 minutes to keep it cold. If you use a microwave to thaw meat, cook it immediately afterward as some parts of the meat may have already started to cook. The quality of the meat at its time of freezing determines its condition, and meats frozen near the end of their shelf life won't have the quality of fresher meats. It is safe to refreeze meat that you've thawed or cooked, but the quality may deteriorate due to moisture loss. Freezing microbes suspends their life cycle, but it does not kill them. When you thaw meat, the microbes can become active and multiply at the same rate as in fresh meat. Under the right conditions, they can multiply enough to cause illness. Freeze leftovers within three to four days, and don't refreeze any food left out of refrigerator for more than two hours, or one hour if the temperature is above 90 degrees Fahrenheit. If meat develops an odor, discard it.